Shortly after installing a new wire harness and getting my Buick running, I wanted to do a few things to make the "Old Girl" pretty again. Of course I still wanted to drive the car while doing these projects so the first thing I decided to tackle was redoing the '37 Buick's woodgraining. 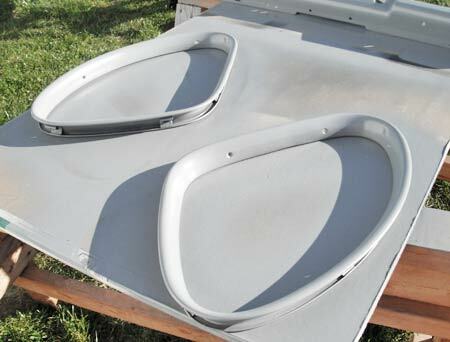 My trim pieces didn't look horrible, but they had some surface rust in several areas and the graining was actually different colors on different pieces presumably because of sun fade. Going back to the late 1930s, there were a few high-end automobile manufacturers (Packard, etc.) 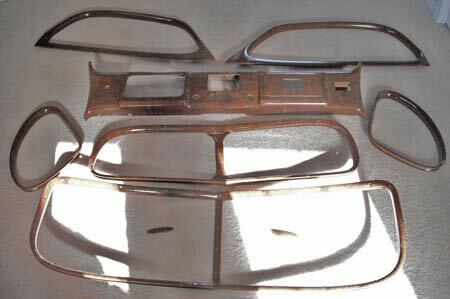 that used real wood as trim pieces around the windows and dash but, for the most part, manufacturers from this era provided metal pieces with a woodgrain pattern stamped or painted on to the piece. 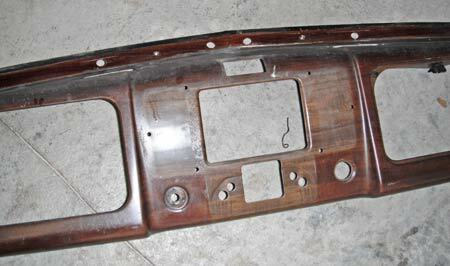 In 1937, Fisher Body applied this woodgrain pattern on to primed metal sheets and then stamped and formed the individual pieces. Using metal was wise because it won't expand and contract the way wood does, it is cheaper to stamp metal sheets than to have a carpenter spend time fitting, cutting and sanding wood and these finished pieces really do look like wood! My first step in this project was to remove all of the garnish moldings and dash. The moldings came out very easily but the dash required more patience. Naturally I had to remove the gauges, knobs, etc. but within a few hours it was all out of the car and on the floor of my garage. 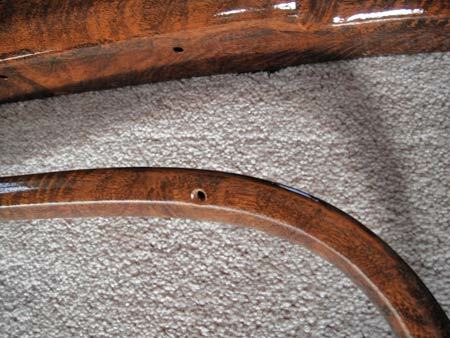 Being at the point of no return it was then time to determine just how I was going to redo my woodgraining — would I send it out to a professional, buy a kit and redo it myself or something different? I did some research and ruled out the professionals (because of cost) and thought I could get acceptable results by myself with a kit. Ultimately though, luck would smile upon me as a couple of friends of mine were staying at my house for Fall Meet in Hershey when I first mentioned my project. 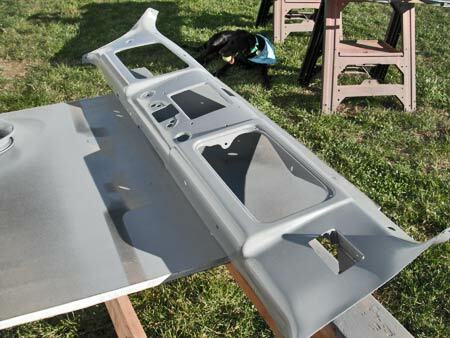 One of them had already purchased a Grain-It Technologies kit for the woodgraining of their 1948 Chevrolet Woody Wagon and their kit was still around just gathering dust. Fortunately for me they very generously said they would let me borrow their kit! Grain-It kits, quite frankly, are pretty darn cool. The way they work is pretty simple. You select a metal plate with the grain pattern of your choice and then spread and screed an ink or graining compound onto the plate. Then you take a soft rubber transfer roller and roll over the plate. The image of the plate is now on the rubber roller and then you simply roll the image on to your piece. That sounds simple doesn't it? Well it is...sort of. 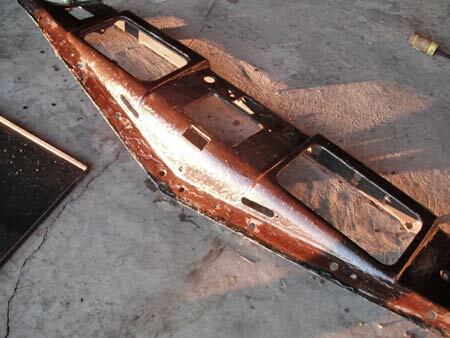 Dash removed â€“ note the difference in colors. The lighter area was actually the area protected from the sun. Unfortunately there is a lot of work involved in getting to the transfer stage of the project. The first thing to do is remove the old paint. My glass bead cabinet wasn't large enough to handle all of the pieces so I decided to use paint stripper. You probably know that you can't get a simpler "tool" than paint stripper — you just brush it on, wait 15 or 20 minutes, and then wipe it and the old paint right off. For me, I found that there were some areas that required several applications of stripper but, eventually, I was down to bare metal. Sizzle, Sizzle. The dash soaks in the stripper. When the pieces were fully cleaned and prepped I primed them with an epoxy primer. For a top or color coat Grain-It only recommends using DuPont ChromaSystem products. Other than stating that their graining compound inks will adhere best to Chroma-Base paint there isn't much explanation why you can't use other paints. By reading discussion forums about this topic I learned that some people had success with other paints but I am not one to tempt the fates. These base colors can be purchased directly through Grain-It or you can use the DuPont paint codes provided on the Grain-It website. Since Chroma-Base paint is very easy to find in my area I simply selected a color that was close to my original base color, picked up the paint at my local paint shop and proceeded to paint my pieces. 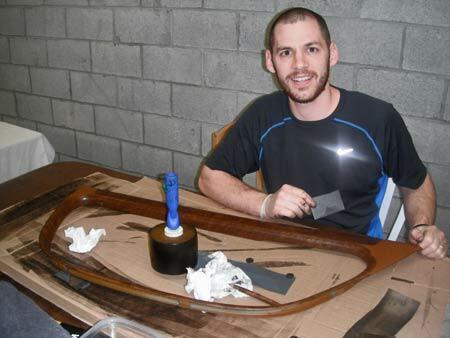 ChromaSystem is a base coat — clear coat system so the finish of the initial color coat is satin. Dash primed (Supervisor looks on). 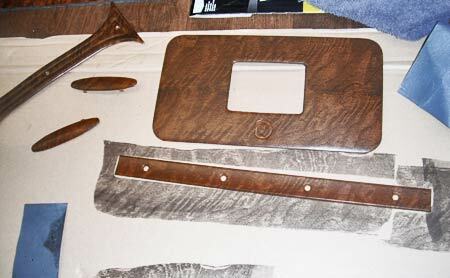 With primed & colored parts it was finally time to start the actual woodgraining process. Grain-It has a fantastic instructional DVD that I watched several times. They also have support forums and FAQs on their website that can help you with your project. After watching the DVD and reading as much as I could I started with a bunch of confidence. My first transfer went on easy and looked beautiful...and then things got tricky. The art (and reason you pay professionals to do this work for you) is blending multiple transfers so that people can't tell where the lines are between rolls. If you just overlapped each roll you would have dark lines on each border. If you left space between rolls you would see too much base color. So, to avoid this, you place "blending paper" (which is really just fine-grit wet sandpaper) to cover most of the area you just grained and hold it in place with magnets. The grain pattern that sticks out from under the blending paper is simply wiped off with a paper towel. Your next transfer then overlaps the blending paper slightly but places most of the new transfer on a bare area. When you remove the blending paper you will see an obvious line so you then have to use brushes, pencil erasers or anything else you find useful to smudge the line enough to make it look like realistic grain but not so much that it just looks like smudged ink. For some reason the graining compound doesn't stick to the sandpaper. I'm not sure why it doesn't stick but I am glad it doesn't because blending paper makes your life and project flow easier. Fresh ink on several pieces. When you are satisfied with your woodgraining you simply let the ink dry for about 24 hours and then cover everything with a clear coat. 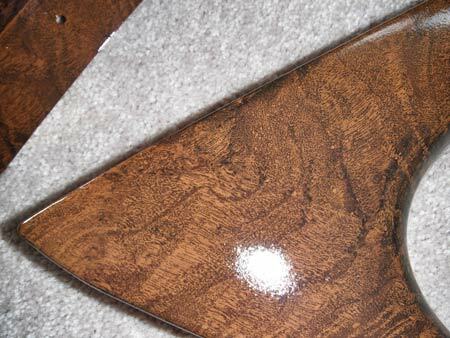 The clear coat I used was recommended and sold by Grain-It and was called "U-Pol Clear #1". It came in aerosol cans and also available from other vendors. I suppose I could have used the DuPont ChromaSystem clear coat but after spending the amount of time and effort I put forth on my project I didn't want to take any risks with incompatibility between ink and clear coat so I stuck with the Grain-It recommendation. It is important to note that when selecting a kit Grain-It offers two graining compound inks — an oil based ink and a water based ink. The kit I used was water-based and the ability to simply wipe off the ink was a relief. As I stated above, the first transfers onto a bare area is easy. When you are left with tiny areas at the end of a piece and have to blend all around these small areas is where things get tricky. There were several work sessions where I simply had to walk away and put the kit aside for a few days because of mounting frustration. I stuck with it though and I feel that my graining looks great. Mid-process. Note the small areas ungrained in right and left corners — these areas required patience. Finished view of the previously mentioned corner. There are four different rolls here blended together. I believe wood graining with a kit like this is just like any other art — it takes a while before you get comfortable with the process and you have to consistently perform the process to stay sharp. By my last piece I was quite comfortable but I think if I had to do another full project now (many months later) I would be back at square one. In total, this project took me about six weeks to complete as I worked on it (inconsistently) during evenings after work. Before I would reinstall the dash and moldings I had clear access to the car's headliner and rubber window seals; two items that desperately needed attention and the next items to jump to the top of my to-do list.